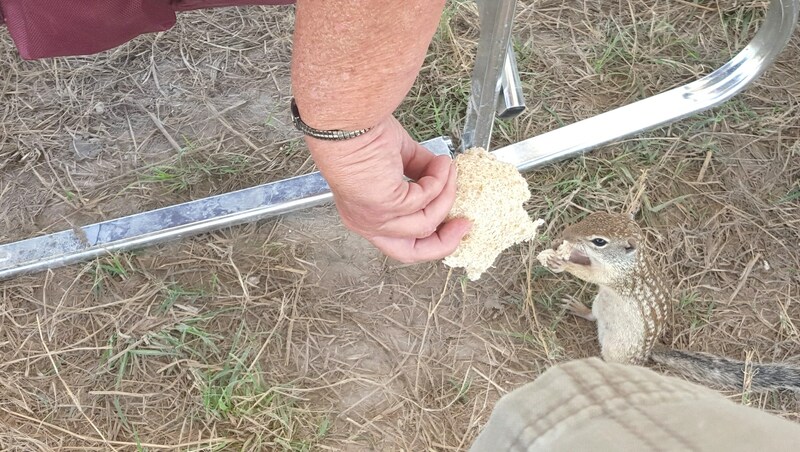 Our Little Mexican Ground Squirrel Friends…..Ralphs – …………. ''AND LET THE FUN BEGIN''……………..
We have been Gate Guarding now for going on 9 weeks. The first 3 we were on the oil rig in Carrizo Springs and then we moved here to the gas pipeline in Tilden. We are Gate 15, one of the last 3 gates to be open of 25. Our gate holds the valves at the half way point of the 30 miles it runs. They are now finishing it up. They were suppose to have had it all done by the 1st. Well that didn’t happen. Every time we think it might be our last day, something changes. The company gave the contractor a deadline of next Wed. The inspector came in and said they needed to pour another concrete pillar to hold up the valves. They only put in 2 and they need 3. Soooooooo, that means they built the new forms on Sat. No concrete delivery on Sunday I guess, but we guarded anyway. Concrete poured yesterday, Monday, and they also put up the fence around the valves. This is a 24″ gas pipe line….I believe it’s larger than the norm. They wanted quantity. So now today is Tue. All they have to do is take off the forms and backfill. Bring in gravel for the base, clean up the extra stuff and then replace our gate with permanent fencing. Do you think they can get that done in 12 hours…….NO………. 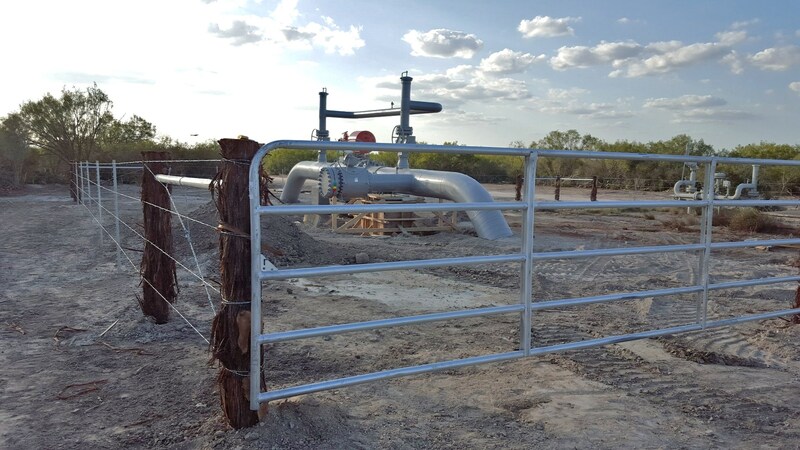 Fencing finished around the valves. 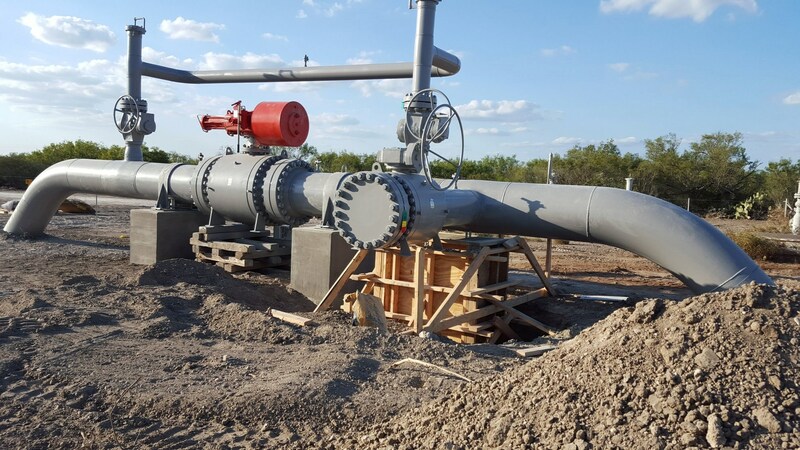 These valves are the midway point between 30 miles of pipeline. Still need the forms taken off the 3rd pillar. Our gate is about 100 feet from here. So now to my favorite subject this blog………..OUR NEW FRIENDS….RALPH and his buddies…. We first started here, you might remember, this little guy would go up to Rich’s shoes and chew on them. He came every day. 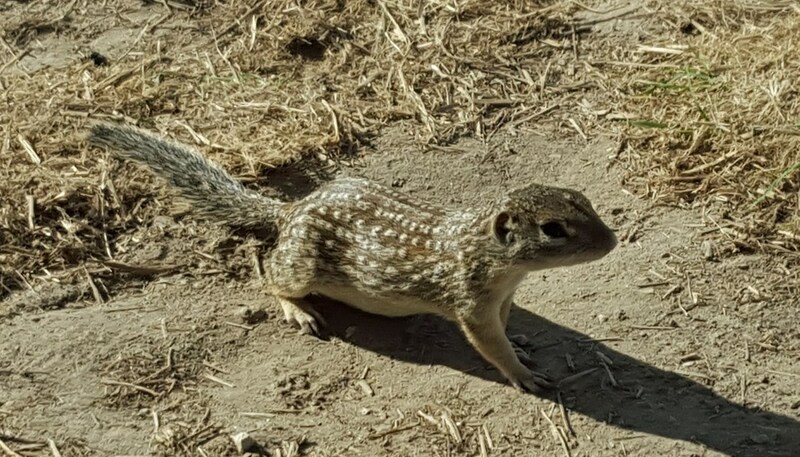 I researched on him and found him to be a Mexican Ground Squirrel, native to Southern Texas and Mexico. He has 9 stripes of irregular rectangular dots down his back. An adult can reach 15″ from his head to the tip of their tail. They live in burrows in the ground and have several different openings. They eat grains, nuts berries, bugs and even road kill. They do like meat. So I put out some wheat bread. Wow, instantly tamed. They loved it. 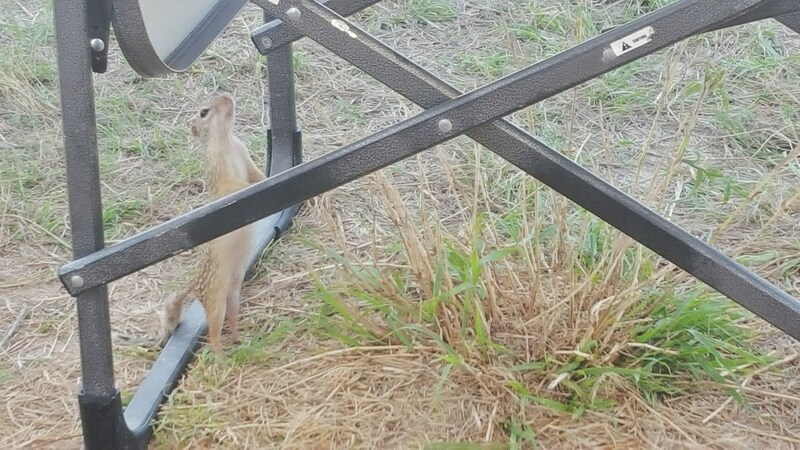 So they started coming over to my side. Rich named the one Ralph. Ralph grew as we feed him….As you see his belly is really filled out. In the sun his fur is shinny. He became a pest. Next we tried left over corn. I think he could smell it from the distance. He came right over. I put it on the chair and he knew it. He climbed right up. Several times he even tried to climb my legs. 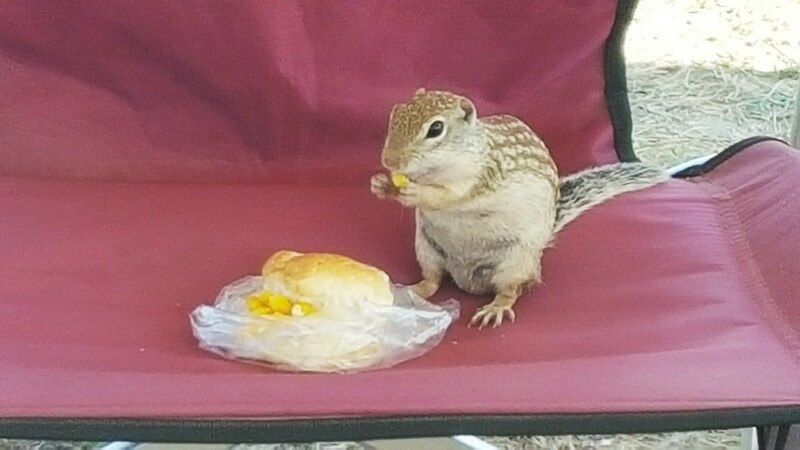 Scared me…….lol….One day Rich was taking a nap, he woke up and Ralph was on his lap…………….hahah……..They also eat and store it in their cheeks and go back to their burrow and store their food. We knew right where Ralph lived. 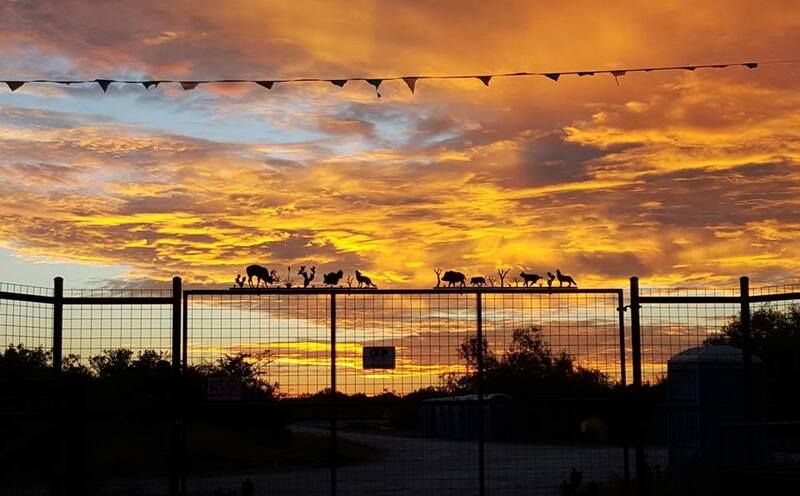 He lived at near the edge of the road where the rancher pulls into his gate. Not a very good place. He gets up in the morning when the sun gets hot. He sits by his hole for 5 to 10 minutes in his erect stance and watches everything around him. If the guys were working in his view, he would watch them for awhile. After awhile more showed up. One came from my side in the cactus area. Rich named him George at first. He would cross under the gate and come and take food. Then he would run back to the gate and eat it. So cute. 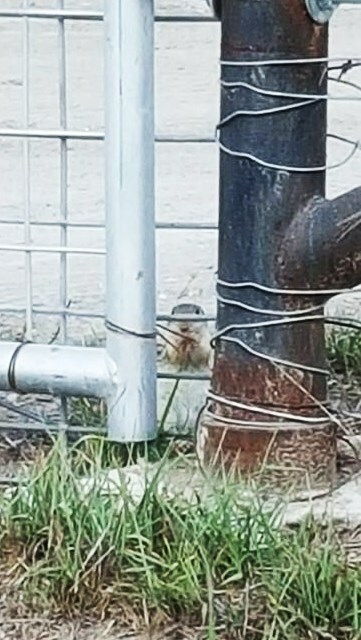 Some times they would hide behind the gate and stare at us….. 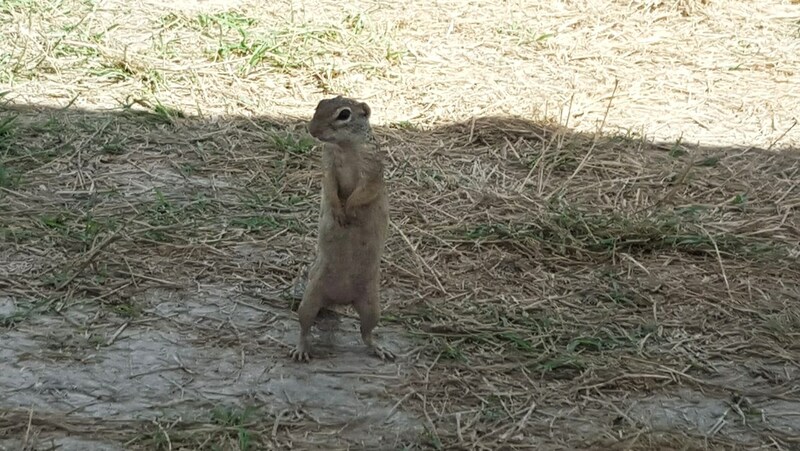 I would say, “Hey Little Buddy, I can see you” Then he would come running for food. They are so darn cute. When they run, their tails fly up in the air and they are so fast. I think the tail is used as a rudder also for many things…When they sit. the tail is straight out most of the times. When they run it is flung over their back towards the front. It helps with their gravity points. Many times they will run just a foot or so, the tail is flung over their back, and then they stop suddenly and the tail fly’s to the ground. One day Rich was eating his cantaloupe and he decided to cut the rind up in pieces. We took a baggie and WOW, they loved it. 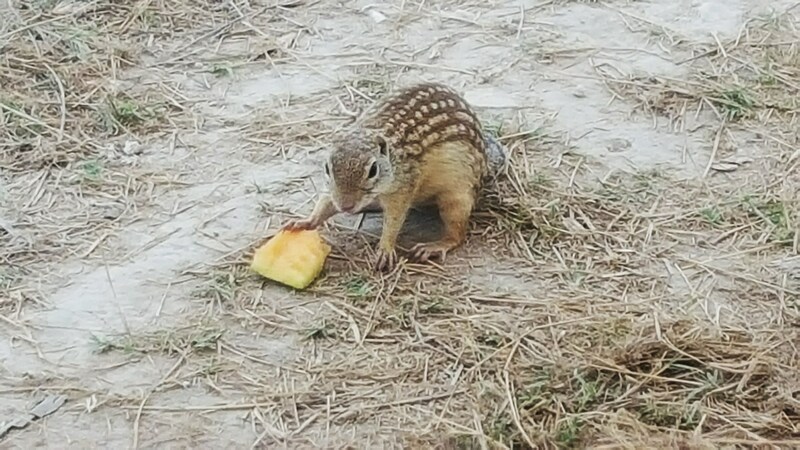 They also love Watermelon rind. They eat it like humans, the eat the meat of it and leave the skin….lol…It think this is the way they must get their water. They live in a dry arid area, and the only way they can probably find their water is from the cactus plants. Their is plenty of them. Now I also set out water for them every day. I use a bottle top and put ice in it to melt. We have attracted more of the little guys. 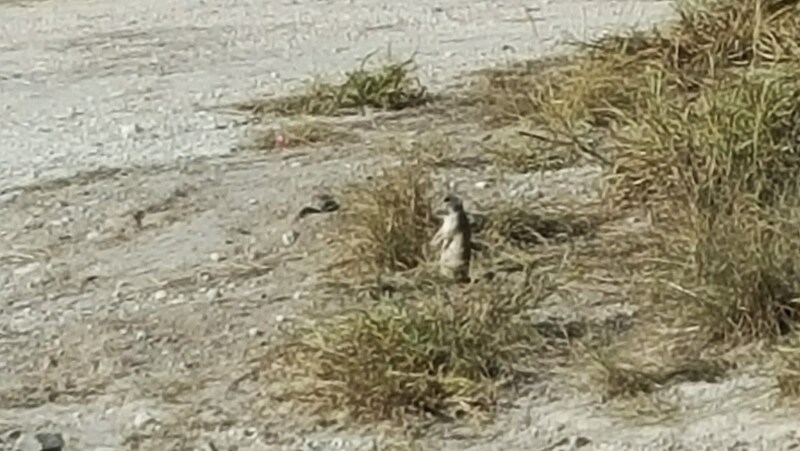 At first, there was just one over by Rich, we named him Ralph. Then several more showed up. 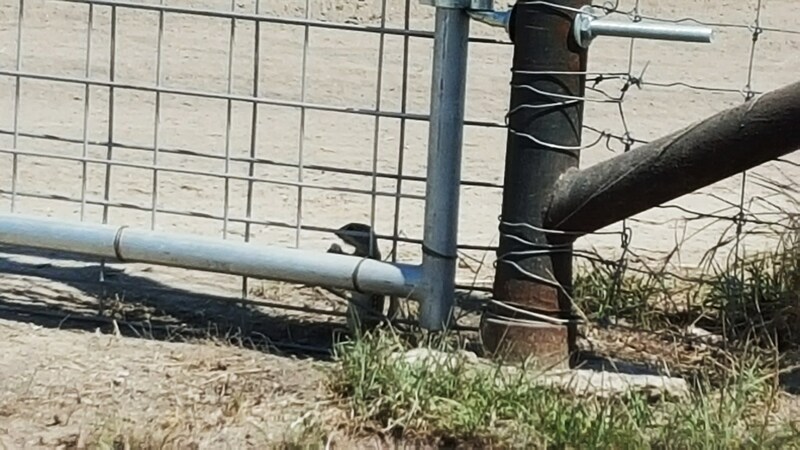 One over by me in the cactus area beyond the fence, George. Then by Rich at the other end of his gate was a sand mound with a number of holes. Another one came from their. Now the sad thing is, we used to know who Ralph was. 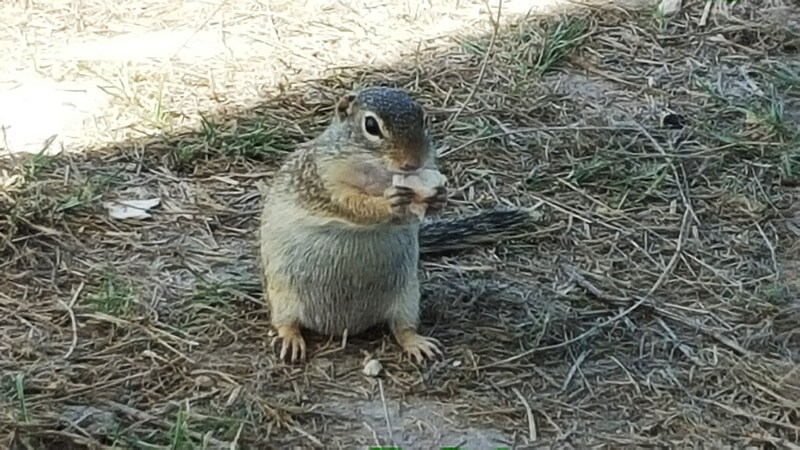 Now we’ve fed them so much, they are all beginning to look alike………Chubby…..lol……Now were up to at least 3 Ralphies…..lol….and 1 new little guy………………….BUT………They are NOT SOCIAL among them selves….. They live alone and don’t like others around. Their tail is small until they get upset. Then it fluffs out and they play tag. At least that’s what it looks like. 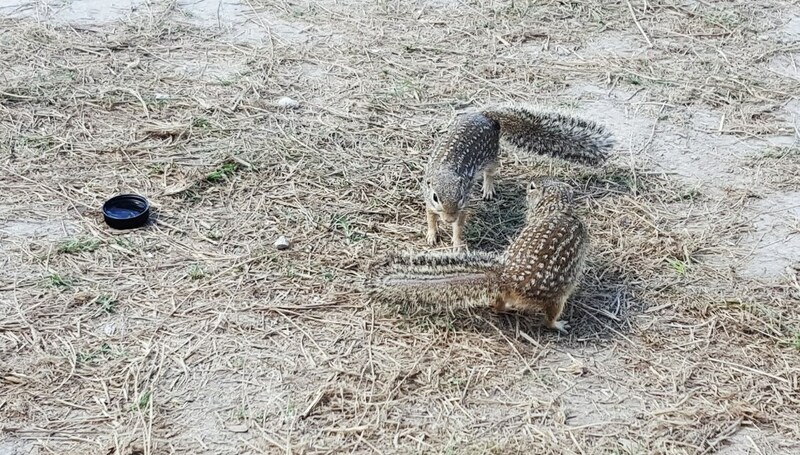 They chase each other in circles and off into the cactus. Then one comes back….then the other one, and it starts again. Even though the history I read says, that they aren’t social, I sometimes got the feeling they were playing. I could be my imagination though. They also make several sounds. When they are spreading their tail, ready for attack, they make a teeth chatter sound. Some times, when they sit and another one is near it is a low pitch vocal chatter. The one I love to hear is the one when they are projecting to a distance. They stand up erect and their mouth is fully open. They project a high pitch shrill chatter, almost like a bird sound. I think it is a sign of claiming territory. They have been so much fun. What else do you do for 12 hours in the Texas desert….lol…. They also love peaches, and one day I gave Ralph my empty yogurt cup. He loved it and carried the cup away to his hole. He put it over the top. lol. maybe his sun shade?. But finally the wind took it away, so I picked it up and put it in the trash. Here’s 2 more cute pictures, and these are the original Ralph, I caught him eating my shoe. These little guys are so cute to watch. They are so smart, and have an awesome lifestyle to watch. No matter what happens here with the pipeline, they have adapted and stayed out of the way. But they watch everything. Its amazing to me, you think your the only one out here for miles sometimes, but you have no idea the eyes that are upon you from the bushes. lol. Could give you the creeps couldn’t it……lol…..Now as our days are starting to get chillier in the mornings….lol….65-70…..I notice they aren’t getting up as early. They wait for the sun to shine and heat up their burrows. 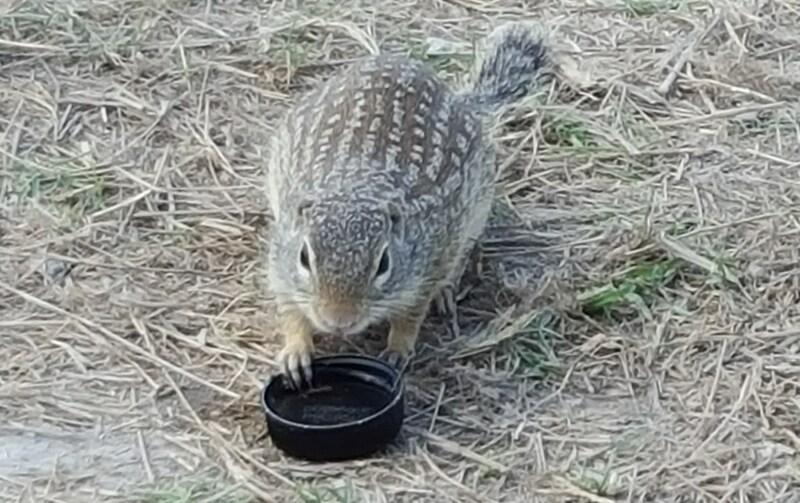 They are suppose to hibernate very soon, but some say the southern Texas ones may not. I bet it depends on the heat of the winter. I was going to write about the Road Runners also, but I will leave that for next time. They are awesome also.